Many people who take an active role in their own health and well being also tend towards naturally-sourced nutritional supplements and remedies for minor ailments, such as taking a cup of chamomile tea to alleviate insomnia, or a peppermint infusion to soothe an upset stomach. In addition to serving as drinkable herbal delights, tinctures can be effective remedies for a variety of health issues, from anemia to PMS, and can also boost your immune system. 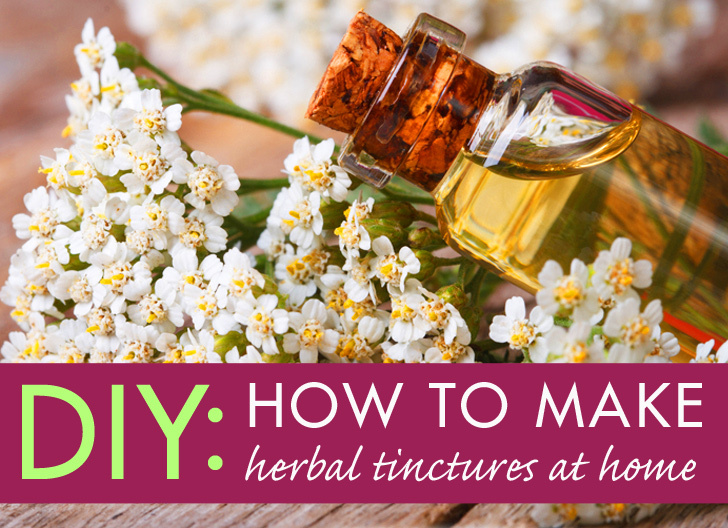 Many herbs and flowers are now ready to be harvested, so read on to learn more about medicinal tinctures, and how you can make your own at home. A tincture is a type of herbal preparation in which the alkaloids, glycosides, minerals, and essential oils of a plant are extracted into a solvent. The liquids that are most often used as solvents are high-proof alcohols such as vodka or brandy, or occasionally apple cider vinegar or even vegetable glycerin. The latter are sometimes used for children’s preparations, or by those who abstain from alcohol of any kind, but they’re not as effective at drawing the medicinal components from the plants. In terms of efficacy, a single dose of a tincture has the same effect as a cup of herbal tea: it’s just concentrated, and absorbed more easily into your body via the alcohol (or other solvent). Some of these tinctures have medicinal properties, while others may have nutritional benefits. High-proof alcohol (at least 80 proof). If you’re in the United States and have access to Everclear, use that. Otherwise, vodka or brandy works well. Alternative to alcohol if necessary: high quality apple cider vinegar. Organic, if you can find it. Small, dark glass bottles for storing the tinctures. Cobalt or amber glass are great, and should have tight-fitting screw-on or snap-down lids. 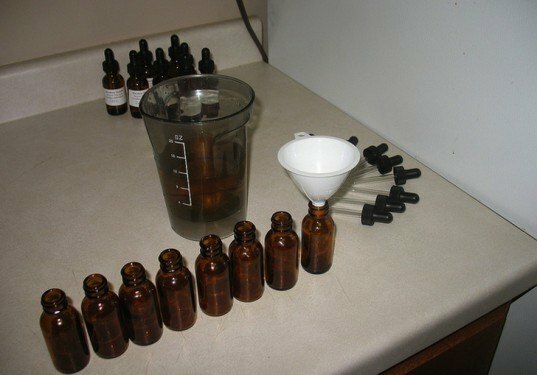 It’s incredibly easy to make your own tinctures: you literally just need to soak plant matter in a menstruum (solvent) for a few weeks so all of its “good stuff” can be absorbed into the liquid. While vodka is usually the best choice, you can use brandy instead. Remember that regardless of the that alcohol is chosen, it has to be at least 80-proof (namely, 40 percent alcohol) to prevent any mildewing of the plant material in the bottle. 100-proof (50 percent alcohol) is better, if you can get your hands on it. This high-proof alcohol acts as a preservative, and if you store your tinctures in a cool, dark place, they can have a shelf life of 7-10 years. If you’re using fresh herbs, chop them up a bit or bruise them with a mortar and pestle. 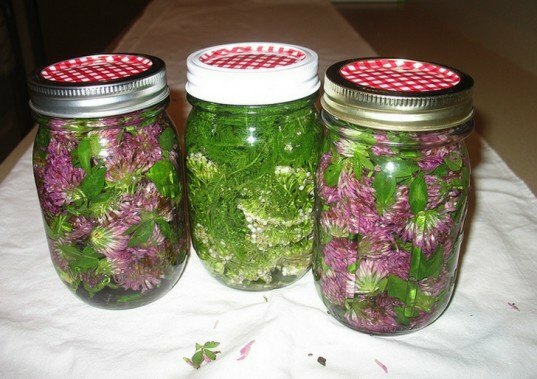 You’ll be putting enough of the fresh herb to fill your jar about 3/4 full, but don’t pack it in too tightly: it should fill the jar well, but be loose enough to move around. 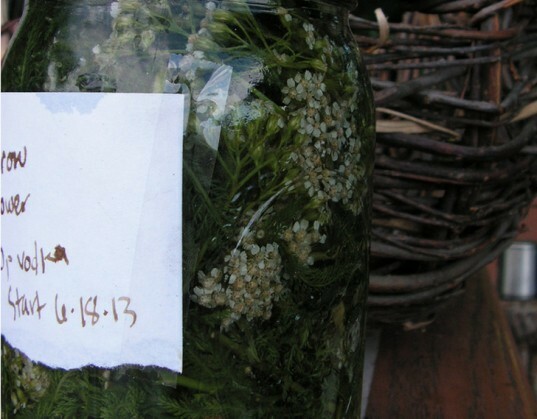 The reason you should leave a bit of head room in the jar is that you need to cover the plant matter completely with the alcohol—no part of the plants should be exposed to the air. You’ll fill the jar with alcohol to the spot where the lid ring begins, and then screw the lid on tightly. 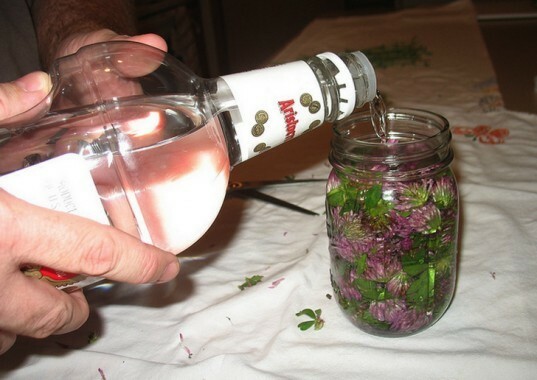 For dried herbs, you’ll fill your pint jar halfway, and then fill with alcohol the same way you did with fresh plants. The reason you have to use less dry root than fresh is that the vodka/brandy/etc. will partially re-constitute the plant matter, causing it to swell up: you need to leave some room for this to happen. Be sure to stir the dried root well to ensure that it absorbs the liquid. 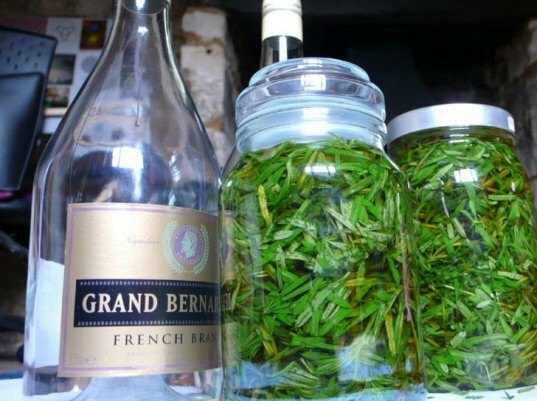 Generally, the ratio of fresh herbs to alcohol is 1:2 (so 1 part plant to 2 parts alcohol), and the ratio of dried herbs to alcohol is 1:4 or 1: 5, but there will always be exceptions to this: be sure to do thorough research on the herb you’ll be tincturing before you begin so you have a good idea of what the required ratio is. Label your jars and date them, and then let them steep in a cool, dark, dry place. During the first week, give the jar a little shake every day to swish the alcohol around the plant matter and move it around a little bit. You’ll then let it just sit in that cupboard (or other appropriate place of your choosing) for another 5 weeks, so it’ll steep for 6 weeks in total. After it has steeped for several weeks, line a fine-mesh strainer with a layer or two of muslin or cheesecloth, and then hold that over your bowl or measuring cup. 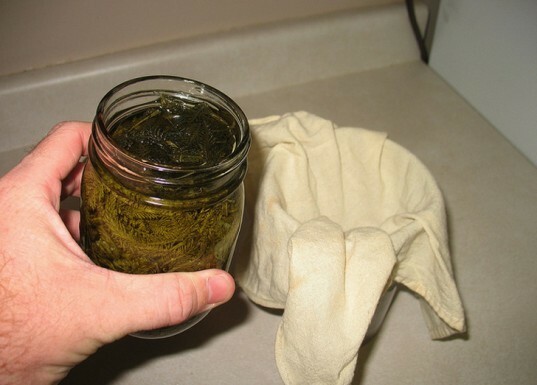 Pour the tincture over the cloth so that it strains well, pressing gently on the herbs to squeeze out the liquid. You can even gather the sides of the cloth and twist it to really squish out every last drop. Compost the used plant matter, and wash out the cloth to be used again another time. Now, you’ll use the funnel to decant the tincture into your little glass bottles (preferably the kind with droppers), filling them close to the top. Label each bottle with the herb used, as well as the date decanted, and then store them away from direct sunlight. If you’d like to watch a demonstration on how to create tinctures, Mountain Rose Herbs has put together a video that takes you through every step. You can watch it here. Please keep in mind that people react to tinctures in different ways, and what works well for one person might not work well for another. Tinctures are not guaranteed to cure serious ailments, nor is it a good idea to mix and match them without having a thorough knowledge of contraindications and such. If you’re feeling ill, it’s important to go to a healthcare professional (be that a physician, naturopath, or herbalist) to get their advice before attempting to self-diagnose and/or self-medicate. Herbs have medicinal properties that may have different effects on those who take them, so it’s vital that you ensure that you know what it is you’re treating before you make/take anything. Additionally, it’s of the highest importance that you know exactly what plant you’re using if you decide to make a tincture for your own use. Going out and foraging for leaves and twigs that bear a vague resemblance to the plant you’re aiming to use can be incredibly harmful, so unless you have total certainty about the plant you’re using, don’t use it. When in doubt, it’s better to err on the side of caution and pick up a tincture from a retailer instead. If anyone is having trouble sourcing Everclear in your state you can find 190 proof 95% grain alcohol designed specifically for extractions at www.culinarysolvent.com. Check them out, they ship directly via FedEx.